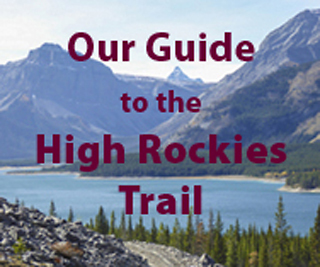 Gillean’s Kananaskis Country Trail Guide, Volume 1, Kananaskis Valley, Smith Dorrien, Peter Lougheed Provincial Park and Elk Lakes, is now shipping and should be available in local stores. More on a formal (informal) book launch sometime in June later. Anyone whose photos we used will receive a free copy. Posted from Crete using my iPhone where we have climbed Mt. Gigilos and hiked the famous and spectacular Samaria Gorge as well as some other hikes. Volumes 2 (Elbow Jumpingpound) and Volume 4 (Sheep) will be out next spring. Vol 2 was supposed to be out this fall, but the printer couldn’t fit it in. On the plus side, it means I can add in some of the new trails to be built at Bragg Creek this summer. I just bought a copy of Volume 1 and it’s great. Any idea when the others will be released? Got my two copies of Vol. 1 through the University of Calgary Bookstore yesterday. There were seven copies left. The presentation is great with high quality glossy paper and rounded corners. The trails are described in more detailed than in the third edition. The colour photos are numerous and provide a very good idea of what to expect. The height gains are provided both in metres and feet. The colour maps showing the trails at the end of the book display them clearly. The UTM 1000 m x 1000 m grid will make the maps useful for location with a GPS receiver. The grid numbers are shown in places and the user may want to complete the number by hand for ease of navigation on the trail. As stated at the beginning of the book, the maps are a mix of imperial and metric units due to the lack of availability of all maps in the metric system. While metric will generally be in the NAD83 reference system, older imperial unit maps will generally be in the NAD27 system. Grid values are different between the two as shown on page 6 where there is a discontinuity between Map 5 and 7. This is normal and cannot be avoided. The Gem Trek maps, being more recent, are consistently in NAD83 avoiding the need to switch reference systems on a GPS unit. This is however only of concern to the off trail hiker. I look forward to receiving the remaining four volumes. This new edition positively re-affirms Gillean Daffern as, excuse the pun, a trail blazer in documenting the Kananaskis Country trail system. The series will be useful for decades! Tremendous effort went into this. Well done and thank you! While hiking in Crete must be great, you must visit Knossos while there to see a civilization 1,000 years more advanced than the Romans. And congrats on getting the book out!